Carol Walker of Truckee powers up a hill in the Racing Gnome snowshoe race at the Auburn Ski Club on Sunday. The Racing Gnome snowshoe races returned after a three-year hiatus due to lack of snow. This past Sunday, some 37 runners tested themselves on the 5K or 10K (two laps) course at the Auburn Ski Club on Donner Summit. 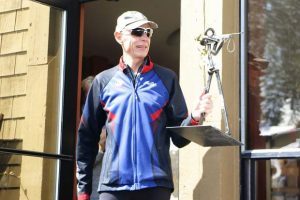 The race was produced by the local running club, Donner Party Mountain Runners, and directed by former national snowshoe champion Peter Fain of Run on Dirt Coaching. Lupe Cabada of Reno took the 10K win with a time of 57:17 on the challenging course. Ross McMahan of Incline Village and the Atlas Snow-Shoe Racing Team was second in 58:25 and fellow Incline Village resident JP Donovan was third in 1:05:02. In the women’s 10K, Sarah Raitter of the Atlas Snow-Shoe Racing Team won with a time of 1:05:55. Incline Village residents rounded out the women’s podium. 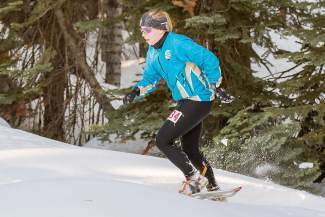 Sarah McMahan, another Atlas Snow-Shoe athlete, took second in 1:13:20, and Naomi Plasterer was third in 1:18:05. Plasterer is going on to compete in her first 100-mile running race next weekend, the Susitna 100 in Big Lake, Alaska. In the 5K men’s race, 9-year-old Noah McMahan of Incline Village bested the field with a time of 39:11. 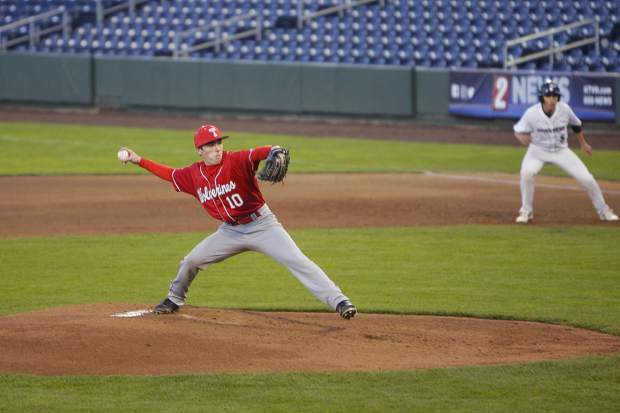 His twin brother, Josiah McMahan, also competed, finishing in a time of 1:04:08. Brian Baxter took second with a time of 39:11 and another young runner, 15-year-old Camden Murphy, took third in 42:09. Baxter and Murphy are both from Rocklin. Helen Pelster of Truckee took first in the women’s 5K and won overall with a time of 37:57. Carol Walker, also from Truckee, was second in 43:24, and JoAnn Ellero of Reno rounded out the top three with a time of 46:25. 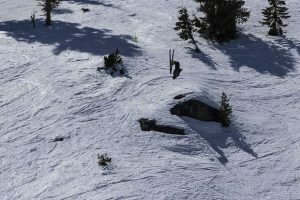 Ample cold snow enabled Fain to set one of his signature snowshoe courses, with about 40 percent of the course set on groomed trails within the Auburn Ski Club system and the remainder off-trail on steep and snowy human-packed terrain. The course ended with a plunge down ungroomed snow on the 40-meter ski jump hill. The 10K racers experienced it all twice before crossing the finish line. For men’s 10K winner Cabada, it was his first snowshoe race. Many racers chose to do a sitting glissade down the final hill, much to the delight of the spectators. “The slide to the finish was the highlight,” said Sharon Fong of Truckee, who competed in the 10K. 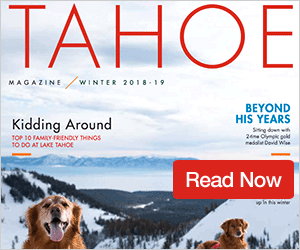 The Donner Party Mountain Runners is a grassroots non-profit running group that exists to inform and inspire mountain runners in the Truckee-Tahoe area. Go to DonnerPartyMountainRunners.com for more info about the club. In addition to Fain, the volunteer race team included founding club members Lorenzo “Spike” Wimmer, Javier Castellar and Pelster. Heidi Gellerman also contributed a delicious homemade soup.